Stavros Niarchos was one of the more enthusiastic and colourful owner/breeders in Thoroughbred racing during his lifetime. He operated his breeding division out of Haras de Fresnay in France and Oak-Tree Farm in Kentucky, while campaigning his horses in France, England and the U.S. His influential passion for the sport has transcended to his family who are continuing the operation under the banner of Flaxman Holdings, winning many world class races with world class thoroughbreds. One of the most important accomplishments by the family has undoubtedly been the great mare Miesque, a daughter of Niarchos’ wonderful stallion Nureyev. Miesque was not only a superior champion on the track, but also became a great foundation broodmare to continue the excellent record of Flaxman Holdings at the highest level of the thoroughbred world. The bay daughter of Nureyev – Pasadoble by Prove Out became a champion at two, three and four. She won championships in three different racing countries. She was victorious in twelve of sixteen races, ten of which were grade/group one races, while placing second three times and third once. She was never off the board in any of her starts. Such a remarkable and consistent career against the best of her generation has marked Miesque as one of the elite competitors in turf history. She was included in the Blood-Horse “Top 100 Thoroughbreds of the 20th Century” poll, placing eighty-second, although she ran only twice in the US. However the two races she did run in were the 1987 and 1988 Breeder’s Cup Mile. Miesque won both races against stellar competition, thus becoming the first thoroughbred in history to win two Breeder’s Cup events. Francois Boutin, the esteemed and legendary French trainer, was the conditioner of Miesque. He had also trained her sire Nureyev. Boutin saw immense promise in the highly strung filly from the beginning. She had very powerful quarters, perfectly sloped shoulders, and displayed a lightning quick burst of acceleration from her perfectly balanced running action. She was head strong, but also very intelligent, and Boutin was a master at getting into the psyche of such an animal. He had Miesque ready for her race début at Deauville on August 9, 1986. Carrying the great jockey Freddie Head wearing the double blue Flaxman Holding colours, Miesque won the six furlong Prix de Lisieux by a comfortable two lengths. Two weeks later the team was back at Deauville for the group one Prix Morny. Miesque was third, beaten a length for it all, in her second race. An increase in distance to seven furlongs for the group one Prix de la Salamandre at Lonchamps a month later resulted in her first group victory as she was one and a half lengths in front of Sakura Reiko, the Prix Morny winner. The race was run on a yielding turf that day as Miesque displayed her courage in the win. Two weeks later, also at Longchamps, Miesque displayed her explosive acceleration in winning the Prix Marcel Boussac by a half length over the highly regarded Milligram and Sakura Reiko. Her three wins from four starts secured Miesque the champion two year old filly honours in France, and was established as the winter favourite for the upcoming filly classics in Europe. The seven furlong Prix Imprudence was her 1987 tune-up race in early April at Maissons-Lafitte. Miesque cruised to an easy two and one-half length win carrying 128 lbs. Next race came the 1000 Guineas at Newmarket. Facing her strongest field yet, Miesque won the classic race by a length and a half over Milligram, on the famed Rowley Mile course. Returning to Lonchamps seventeen days later, Miesque added her second classic victory with a dominating two and a half length victory in the Poules d’Essai des Pouliches, the French 1000 Guineas equivalent. Clearly Niarchos and Boutin had a budding superstar on their hands in the very fast bay daughter of Nureyev. The Prix de Diane, or as it is commonly referred to as the French Oaks, was next on Miesque’s racing agenda. At a right handed distance of one mile and five-sixteenths of the lush Chantilly race course, this classic would be a good test to see if Miesque could carry her blazing speed at a longer distance. However the top class filly Indian Skimmer won the race by four lengths over the soft going, relegating Miesque to second place in a very game effort. Miesque was given a two month lay-off until her next test of class which would come against older males in the prestigious group one Prix Jacques le Marois at one mile in Deauville. Miesque was rated towards the back of the field by Freddie Head until unleashing her devastating turn of foot to win the race by an increasing three lengths over Nashmeel and Hadeer. The course was rated as good that day, which gave Miesque a perfect footing to show off her talent. Three weeks later, Boutin had Miesque back at Longchamps for the Prix du Moulin and another stern test against a high class field of older males and females. In the race was Sheikh Mohammed’s Soviet Star, the winner of the Poule d’Essai des Poulins earlier in the season. Miesque stalked the leaders in the one mile event, which was run over a yielding course, and then took the lead at the six furlong mark. Head then guided his filly to draw out to a two and one half victory over Soviet Star and take their fourth group one win of the season. Miesque was now the darling of the French racing public. She would however taste defeat in the Queen Elizabeth II Stakes at Ascot, finishing two and one half lengths behind old foe Milligram, but ahead of Sonic Lady. Steve Cauthen deputised for Freddie Head on this day, but this was not seen as the reason for the defeat. The one mile race at Ascot is a gradual uphill climb, and the going was a bit slow. The combination of the high class opponents, gravity and the footing were reasonable excuses. However Miesque did not disgrace herself in the defeat. Boutin and Niarchos decided to take Miesque on the long trip to Hollywood Park for the 1987 Breeder’s Cup Mile. Here she would again test her talent and speed against the best milers on the planet. Combined with the very warm weather and the hard turf surface of the tight Hollywood Park turf course, Miesque was asked to overcome a new set of obstacles to win her race. She would do so in very impressive fashion. The American betting public was not convinced of Miesque, sending her off at 7/2 odds as the second choice to Sonic Lady. Milligram was also in the race as was American turf stars Temperate Sil and Double Feint. Freddie Head had her closer to the pace and let her loose coming around the final bend. Miesque blew past her rivals midway down the home stretch to win easily by three and one half lengths, in the blazing time of 1:32 4/5. Her performance was so impressive that she captured the Eclipse Award as the top female turf runner in North America based on the one race she entered. Miesque was also awarded as the champion three year old filly and champion miler in both France and England. Normally such an excellent three year old campaign would see most connections retire such a champion to the breeding shed, but Niarchos and Boutin sportingly brought Miesque back for a campaign the following season. In 1988 Miesque made four starts, all in grade/group one events. She came out for her first start as a four year old in May for the nine furlong Prix d’Ispahan at Longchamps. Miesque captured the race over Saint Andrews and Jalaajel comfortably. She was not to be seen again until August in the Prix du Moulin de Longchamps. Soviet Star handed Miesque the only loss she would suffer during the year. Back a mere ten days later at beautiful Deauville for the Prix Jacques le Marois, Miesque won the group one race over the crack miler Warning, who had earlier in the year won two group one mile races in England. Miesque was now ready to make history and defend her Breeder’s Cup Mile crown. The 1988 edition of the BC Mile was to be run at Churchill Downs. This course which is inside the main dirt track is tight and narrow, quite similar to the Hollywood Park course although the turns are a tad sharper in the configuration. However, as opposed to the warm dry conditions from the previous year, the Churchill Downs course on this day would be cold and damp and the course was rated as soft for the fifth running of the championship race. In the race Master Christopher broke smartly from the gate and set the pace around the first turn followed by Simply Majestic while Miesque went around the first turn three wide and ten lengths behind. Approaching the far turn Miesque had made up six lengths and was poised for her run. The field had bunched up through the turn with five horses in front of Miesque. Niccolo Polo took the lead at the top of the stretch but Miesque was now rolling and swept around on the outside to come after the leader. Miesque passed a fading Niccolo Polo and relieved Simply Majestic of the lead at the furlong pole. She would pour it on, in the words of Tom Durkin, and win the race by a comfortable three and one half lengths over the late charging Steinlen, with Simply Majestic third. Freddie Head pumped his fist in the air as his great filly powered past the finish line. 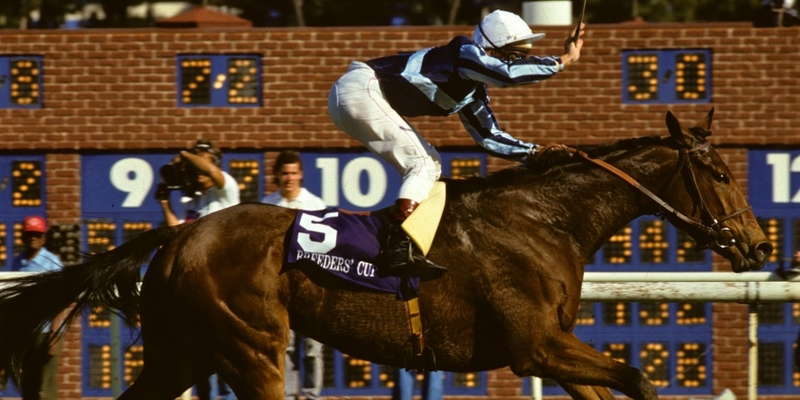 In defending her BC Mile crown, Miesque became the first Thoroughbred in history to win two Breeder’s Cup races. She also repeated as the Eclipse Award champion turf female solely on the one race she ran in the U.S. It was déjà vu all over again. Miesque also garnered two year end awards in France as the champion miler (again) and as the champion older mare. Miesque retired full of honours to the Niarchos family farm in Kentucky, which is now part of the huge Lane’s End operation. Miesque became one of the few mares in turf history to be an undisputed champion and then reproduce herself with her offspring. Her first breeding was to the great Mr. Prospector and in 1990 she presented the world with her bay son Kingmambo. Kingmambo won the classic Poules d’Essai des Poulins as well as the group one St. James Palace Stakes and the group one Prix du Moulin. Retired to stud at Lane’s End, Kingmambo has become a world-wide influential sire of such greats as Lemon Drop Kid, Henrythenavigator, Divine Proportions, King Kamehameha, and King’s Best, all classic winners. The next foal produced by Miesque was East Of The Moon, a filly by Private Account. East Of The Moon became the champion three year old in France in 1994 when she won the classics Poules d’Essai des Pouliches and the Prix de Diane, as well as the Prix Jacques le Marois. Later she has produced her daughter Moon Driver by Mr. Prospector, who is a group three winner, while another daughter of East Of The Moon named Canda is group stakes placed and is the dam of group three winner Evasive. East Of The Moon is also the second dam of group two winner Tenth Star. The third foal produced by Miesque was Miesque’s Son, a full brother to Kingmambo. Miesque’s Son won the group three Prix de Ris-Orangis and place second in two group one races. He is the sire of champion turf horse Miesque’s Approval and multi grade one winner Whipper. The fourth foal in as many years produced by Miesque was Moon Is Up, by Mr. Prospector’s son Woodman. Moon Is Up also became the fourth consecutive stakes winner from our heroine, when she captured the Prix de Lieurey. This daughter of Miesque has done well as a producer as she is the dam of South African group one stakes winner Amanee and is the second dam of Karakontie, winner of the Breeder’s Cup Mile and Poule d’Essai des Poulins as a three year old, and the Prix Jean-Luc Lagardere as a two year old. The next foal from Miesque in 1995 was Monevassia, a full sister to Kingmambo and Miesque’s Son. Monevassia placed once in two starts, breaking the stakes winners streak of her dam. She would make up for this though as Monevassia is the dam of champion two year old filly Rumplestiltskin and group three stakes winner I Am Beautiful. Rumplestiltskin has produced Yorkshire Oaks winner Tapestry and group three winner John F Kennedy. Miesque produced one more stakes winner in 2000 in the form of her dark bay son Mingun by A.P. Indy. Mingun won the group three Meld Stakes and the listed Celebration Stakes to earn his black type on his pedigree. He stood at Lane’s End until 2010, when he was sold and relocated to York Stud in Denmark. Miesque had a total of fourteen foals and is seen in countless pedigrees of top class thoroughbreds through her offspring. She was able to pass on her talent and class to future generations. Miesque earnerd more honours after her racing career was over when she was inducted into the National Museum of Racing Hall of Fame in 1999. The Prix Miesque, a seven furlong race for two year old fillies run at Maissons-Laffitte, inaugurated in 2001 is run annually in her honour. Memorable champions such as Miesque come along very rarely. When one does, the memories are full of the great performances against top level opponents and of battling conditions which could adversely affect the performance of an ordinary horse. Miesque had it all, intelligence, attitude, class, speed and an ability to accelerate at any given point in a race. It was said that she was never happy if beaten and would stomp and behave for a day while she got over it. When she won, she would prance and strut her stuff proudly, with an air of superiority. Miesque was very good, and she knew it. Miesque was also a rarity in that she was able to transmit her great running ability and courage to some of her offspring, and they to their offspring. Her’s is a legacy which has many more chapters to be written. She has brought great pride to the Niarchos family of thoroughbred enthusiasts. Before he passed away in 1996, Stavros Niarchos had stated that Miesque was the best horse he had ever bred and/or raced. Miesque passed away from old age in 2011 and is buried at Lane’s End in the Oak Tree cemetery. Miesque is a bona fide “Queen Of The Turf”, a true legend. When i was a kid getting into racing i fell in love with miesque watching her win her breedrs cup races. I followed her son kingmambo and i collected lots of pictures of her and her kids. Thanks for writing this wonderful story about miesque i enjoy reading so much.